Shouldn’t food be a right, not a privilege? And what is the difference between being fed and being nourished? With a central theme of food justice, such subjects were explored during the three-day, inaugural California Higher Education Food Summit held Jan. 16-18 at UC Santa Barbara. Founded by a multicampus team of University of California staff and students, the first-of-its-kind conference is part of the ongoing UC Global Food Initiative. The gathering convened some 150 students, staff and faculty from UC, California State University and community college campuses, and community and food agency leaders at large, to dissect and discuss the environmental, social and economic pressures that create barriers to food access, security and justice. In a wide-ranging and rousing talk addressing the “complexity and significance of food justice,” keynote speaker Nikki Silvestri said, “When we talk about justice, we are actually talking about everyone, from beginning to end. Silvestri’s keynote talk and a panel discussion at the summit were part of UC’s Food Equity Lecture Series, sponsored by the UC Global Food Initiative. For Colin King, a fifth-year student at UC San Diego, the fight centers on food access for college students who are struggling with hunger. Working with his campus’s Associated Students staff, King is part of the team launching UCSD’s first food pantry. A similar hope coursed through the conference on behalf of the broader UC Global Food Initiative (UCGFI), which is designed to coordinate resources systemwide to help ensure adequate nutrition — starting with access to food — for all. Unveiled by UC President Janet Napolitano in July, the UCGFI is working to harness the UC’s collective excellence in research, outreach and operations in a sustained effort to develop, demonstrate and export solutions — throughout California, the U.S. and the world — for food security, health and sustainability. More than two dozen workshops held over the course of the conference tackled subjects from culinary medicine to new models for student dining, the health implications of food insecurity and the role of higher ed in the greater food system. There also were presentations on the “Swipes for the Homeless” program that UCSB and UCLA have adapted to aid food-insecure students, how to build partnerships between university campuses and local farms, and the transformational potential of campus gardens. UCGFI projects include efforts to assess food security for UC students in order to better design programs and outreach efforts focused on addressing these issues. Fortino Morales helped bring a community garden to UC Riverside while a student there. Now he staffs it as UC Riverside community garden coordinator. At UC Davis, students learn to grow produce sustainably at the student farm and sell it for use in campus dining halls or through subscription market baskets in the community. A new program collects some of what’s left — surplus, blemished or odd-shaped produce — and makes it available at the student-run food pantry. “It’s all local. It’s all organic. The students love it. The feedback is terrific,” said Misbah Husain, UC Davis food pantry director of internal operations. UCGFI fellow Alyssa Billys, of UC Santa Cruz, is working to help coordinate the amount of produce from the student farm that is sold to campus dining. Empowerment was the prevailing spirit of the first-ever summit. This entry was posted in News and tagged Foodbank of Santa Barbara County, News on February 10, 2015 by Judith Smith-Meyer. This entry was posted in News and tagged Foodbank of Santa Barbara County, News on December 16, 2014 by Judith Smith-Meyer. Many working families made tough choices in Santa Barbara County to make ends meet and ensure there was food on the table over the past year, according to the Hunger in America 2014 study released by the Foodbank of Santa Barbara County and Feeding America. Of the 140,575 residents served by the foodbank, more than 70 percent of households reported having to choose between paying for food and paying for utilities or transportation in the past 12 months. The same struggle was seen in 60 percent of client households that had to choose between food and medicine or medical care during the same period. These struggles have led more than 70 percent of households served by the foodbank to adopt three or more strategies to stretch their food budgets. These game plans could involve eating food past its expiration date, buying cheap and unhealthy food in lieu of healthier options, growing food in gardens or selling personal items to pay for groceries. Families may also dilute foods and drinks to make them last longer. “The Hunger in America 2014 findings demonstrate the urgent need for all of us to address hunger in our communities,” said Feeding America CEO Bob Aiken, whose organization is the nation’s largest hunger-relief agency. One of those findings was that 35 percent of clients had not signed up for SNAP benefits, also known as food stamps. In Santa Barbara County, those benefits fall under CalFresh, and county staff pointed to a number of reasons why people do not apply for benefits for which they may be qualified. They may worry about their immigration status, assume it would be difficult to apply or stay enrolled in programs and assume they are not eligible, according to Dennis Tivey in the county social service department. Hunger is an especially timely topic in Santa Barbara County where about a quarter of the population sought out food assistance in 2013. Of those clients, 49,729 were children and 21,750 were 60 years or older. Food insecurity has stressed many areas of families’ lives over the past year, with 52 percent of client households having had to choose between buying food and paying rent or the mortgage at least once along with other struggles. With this information and the other data available in the 2014 report, the foodbank plans to strengthen its community impact efforts, which focus on the affect the foodbank is having and can have on hunger in communities around the county. It also plans to develop its Food Action Plan, which will lead to a more sustainable food system in the future. Published on 12.12.2014 8:08 a.m.
Over 70 percent of local households seeking food assistance from the Foodbank of Santa Barbara County’s network have to choose between paying for food and other necessities such as utilities and transportation, according to the Hunger in America 2014 report for Santa Barbara County. Working families countywide are making other tough trade-offs between food and housing, medicines and education opportunities. The recent study was conducted by the Foodbank of Santa Barbara County in partnership with Feeding America, the nation’s leading domestic hunger-relief organization. The study supports and confirms statistics collected by the Foodbank on the number of people served and amount of food distributed by the organization. The Feeding America data provides an understanding of the economic circumstances and the factors that those relying on Foodbank encounter. Nationally, Hunger in America 2014 found that more than 46 million people turn to agencies and programs of the Feeding America network of food banks every year. The Foodbank of Santa Barbara County has had over a decade of partnership as a member of the Feeding America network. The study documents household demographics and offers a snapshot of the people served by the Foodbank — their circumstances, the challenges they face and the choices they are forced to make living on extremely limited household incomes. It is also the first nationally-representative study that assesses the prevalence of past and current members of the U.S. military and adult students receiving charitable food assistance. » The Foodbank of Santa Barbara County last year, served 140,575 people — over 25 percent of the local population, including 49,729 children (0-17 years old) and 21,750 seniors (60 years or older). 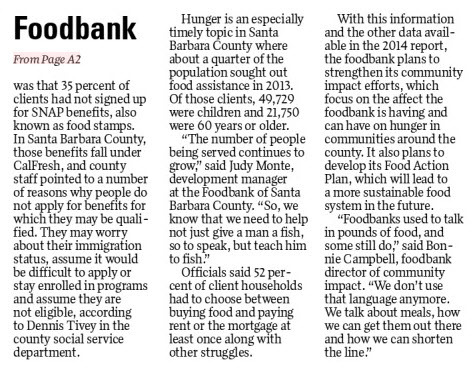 » A full 35 percent of Foodbank participants are children under age 18. » Among all clients, 3 percent are black/African American, 65 percent percent are Latino and 38 percent are white. » 17 percent of households include someone who is a veteran or who has ever served in the military, and 39 percent of those households include someone who is currently serving in the military. » The Foodbank distributed 9.3 million pounds of food (over 50 percent was fresh produce), through its nine direct-to-client programs for children, families and seniors at 100 sites countywide, and through its network of over 330 member nonprofit partners. » Last year, 600 volunteers contributed over 20,146 hours of their valuable time and service to make Foodbank’s services possible. » An estimated 71 percent of households reported using three or more coping strategies for getting enough food in the past 12 months. » These trade-offs included: eating food past its expiration date, purchasing inexpensive, unhealthy food because they could not afford healthier options, growing food in a garden, pawning or selling personal property, and watering down food or drinks. » 70 percent report choosing between paying for food and paying for utilities. » 74 percent report making choices between paying for food and paying for transportation. » According to imbrex.io/ 52 percent of households chose between paying for food and paying their rent or mortgage at least once in the past 12 months. » An estimated 38 percent of client households currently receive SNAP benefits, while an estimated 35 percent of client households neither currently receive SNAP nor have ever applied for SNAP benefits. » 60 percent of households reported having to choose between paying for food and paying for medicine or medical care at least once in the past 12 months. » 21 percent of households include a member with diabetes. » 49 percent of households have a member with high blood pressure. » An estimated 55 percent of households have a household member who had worked for pay in the past year. » In 65 percent of client households the most-employed person from the past 12 months is currently out of work. » An estimated 87 percent of households reside in non-temporary housing, such as a house or an apartment. An estimated 20 percent of respondents have experienced a foreclosure or eviction in the past five years. » 4,425, or 3 percent of families are homeless. Hunger in America 2014 was conducted using rigorous academic research standards and was peer reviewed by a technical advisory team including researchers from American University, University of Illinois at Champaign-Urbana and the Urban Institute. Nationally, confidential responses were collected on electronic tablets by 6,000 trained data collectors, majority of whom were volunteers. The study was funded by The Howard G. Buffett Foundation. A summary of the findings is available by clicking here. The full national report is available on Feeding America’s website atHunger in America 2014 by clicking here. This entry was posted in News and tagged Face of Hunger, Foodbank of Santa Barbara County, News on December 12, 2014 by Judith Smith-Meyer. This entry was posted in News and tagged Foodbank of Santa Barbara County, News on December 11, 2014 by Judith Smith-Meyer. Food Action Plan: Similar to our 2013 agriculture policy report for the Environmental Defense Center, LoaCom is working on behalf of the Community Environmental Council and Food Bank of SB County on the creation of a Food Action Plan for the region. 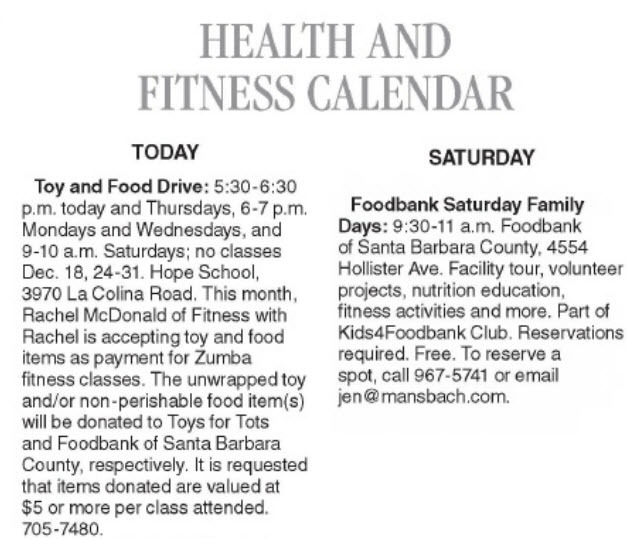 This entry was posted in News and tagged Foodbank of Santa Barbara, Foodbank of SB County, News on December 10, 2014 by Judith Smith-Meyer. 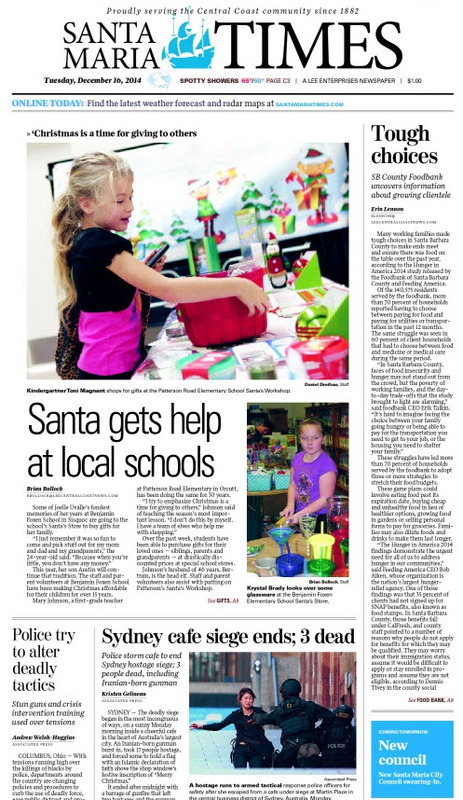 SANTA BARBARA, Calif. – Buying a traditional holiday pie this month will help feed those in need as well. 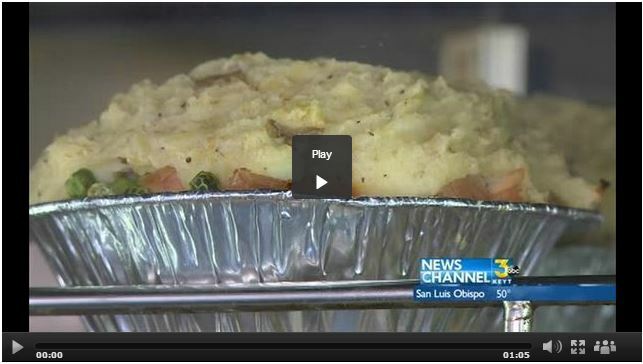 Mac’s Fish and Chip Shop in Santa Barbara is now making pies that are like a complete turkey dinner. Each one is loaded with mixed vegetables, roasted turkey, stuffing and topped with parsnip mashed potatoes. They cost $7.50 each with $5.00 of that going directly to theFoodbank of Santa Barbara County. Owner Grant MacNaughton says it’s “deceptively filling.” Each pie weighs in at over a pound, “and it contains everything I associate with a Thanksgiving meal here in the U.S. or a Christmas meal back in London,” he said. The holiday pies can be enjoyed at the restaurant, and also taken cooked or uncooked – to go – for home parties. Mac’s is at 503 State St. near Haley. This entry was posted in News and tagged Foodbank of Santa Barbara County, News on December 9, 2014 by Judith Smith-Meyer. This entry was posted in Fitness, Health, News and tagged Fitness, Foodbank of Santa Barbara County, health, News on December 9, 2014 by Judith Smith-Meyer.